The Guwahati railway station in the capital city of Assam is the first railway station in India to be fully solar-powered. A major railway thoroughfare in India’s northeastern region, the station handles around 20,000 passengers every day. 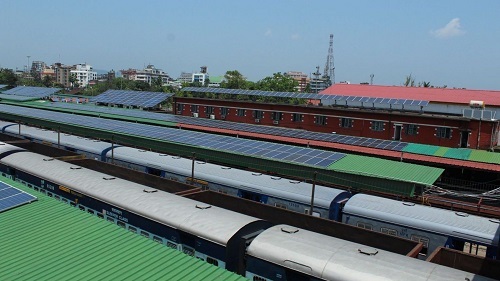 The Guwahati railway station building has grid-connected rooftop solar panels totalling a capacity of 700 kilowatt (0.7 megawatt) that will cater to the electricity needs of the station, the coach depot, and the railway colony area, the Northeast Frontier Railway, an arm of the Indian Railways. This will help the railway network save around $99,900 per year in electricity bills. State-run engineering company Central Electronics executed the $ 1 million project, which has been funded by the Container Corporation of India (CONCOR), a subsidiary of the Indian Railways. The Indian Railways is currently the country’s largest consumer of electricity and diesel and spent around 18% of its operational expenses, on fuel in the financial year 2016. In part to bring down this burgeoning fuel bill, the state-run transportation network has been taking steps to transition to renewable energy for a few years now. The solar-powered railway station initiative is part of the Indian Railways’ broader plans to put up 5,000 MW of solar power capacity to meet around 25% of its energy needs through renewable energy by 2025. In July last year, the Indian Railways rolled out the first set of train coaches with rooftop solar panels that powered the lights, fans, and information display systems inside. The coaches were used for suburban transit in New Delhi, and the railways estimate that each train with six solar-powered coaches could save around 21,000 litres of diesel every year. Indian Railways will soon run trains using solar power from arrays of photovoltaic cells deployed on both sides of select electrified tracks in 10 states, replacing 4,000 MW of coal-fired electricity in bid to become a green transporter. India’s push to promote domestic manufacturing in the solar power segment may soon get a boost, thanks to the Indian Railways. The world’s fourth-largest railway network is planning to replace almost its entire power supply from thermal power plants with solar power plants. The Ministry of Railways could soon issue tenders to set up solar power projects of 4 gigawatts of capacity to power locomotives. The power supply is expected to meet the traction demand only for Railways. Project developers would be asked to set up solar power projects on either sides of the railway tracks, over the land owned by Indian Railways. To meet the traction demand of locomotives Indian Railways currently sources 4 gigawatt capacity from various thermal power plants spread across the country. The planned solar power tender would reportedly reduce Indian Railways’ annual electricity bill by 20% in the first year, and by 40% thereafter. For non-traction power consumption, the Railways is already working to set up rooftop solar systems at around 7,000 stations. ABB is making headway in India with a new train deal worth $42 million with Indian Railways. ABB will supply its traction equipment across the rail network to improve the efficiency of existing equipment and to improve the reliability of the Indian rail network. The deal will supply ABB’s industry leading converters for electric trains to Diesel Locomotive Works in Varanasi in Northern India. ABB will build the converters at one of ABB’s largest locomotive supply factories in Nelamangala, in Southern India. Seeing a company that is literally named for a competing internal combustion rail solution purchase such a large quantity of ABB’s electrified rail technologies is a huge win that indicates just how competitive electric rail is in diverse economies around the world. Not only does it clean up the air around the rail lines, it eliminates the point-of-use emissions stemming from rail altogether.